Today is a REALLY exciting day! 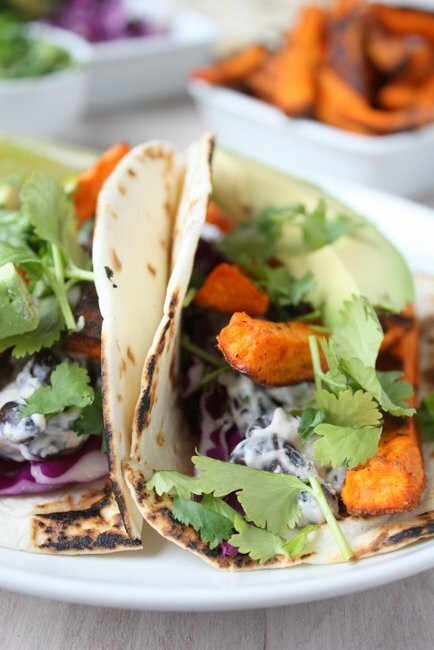 First, I’m sharing this freaking delicious blow-your-mind recipe (I’m not kidding, I could eat these tacos all day, every day). Second, somebody in this house turns 30 today! I’ll give you a hint: It’s not me! Happy Birthday, sugar! Also, somebody in this house recently shaved their moustache. Again, not me. I’ve spent this week affirming the fact that I am terrible at crafts. Truly, terrible. I can do things like knit, or paint (abstractly), or assemble structural things. Give me some paper and I’m like a kid who hasn’t learned how to use scissors or line up edges yet. I fumble with great success, and produce a paper product that looks like it was assembled by a fingerless monkey. Perhaps that’s what I should be called from now on: a fingerless monkey. Not one to easily give up, I have pushed on (trading glue for tape, and precision for “cuteness”), producing what Derek deemed “The BEST gift [he has] ever received!” Oh yeah. I claimed that title [YES!]. Really though, I had a lot of help from his friends and family — so I owe a big “thank you” to everyone out there who helped contribute. Back to tacos. In addition to affirming my lack of paper-crafting skills, I also FINALLY learned how to make crispy, non-soggy, sweet potato fries. Why didn’t anyone tell me the secret before? Seriously, this might change my life! I’ll let you all in on the secret: SPACING. Don’t crowd your fries, otherwise they’ll just steam each other. Let the type-A in you live a little and line your taters up like little soldiers: straight and strong, spaced out just a little bit. If you want them to blacken a little bit, I recommend not even using parchment paper on your baking sheet. Just let ’em cook (NO FUSSING WITH THEM), then flip, and let ’em cook some more. I just changed your life, didn’t I? You’re welcome. Also life-changing: get your hands on some chili olive oil. 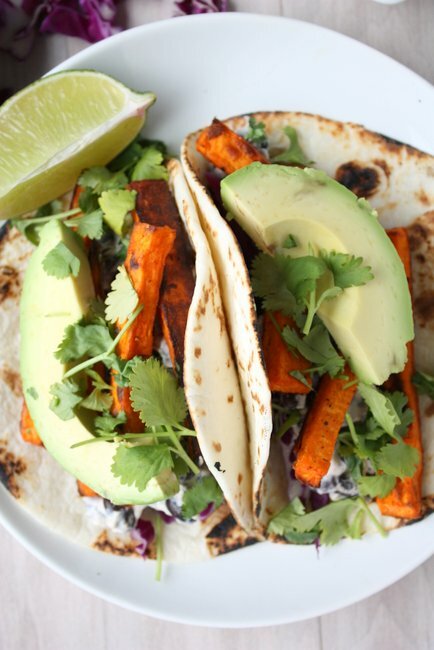 In all reality, these tacos are super simple to throw together. 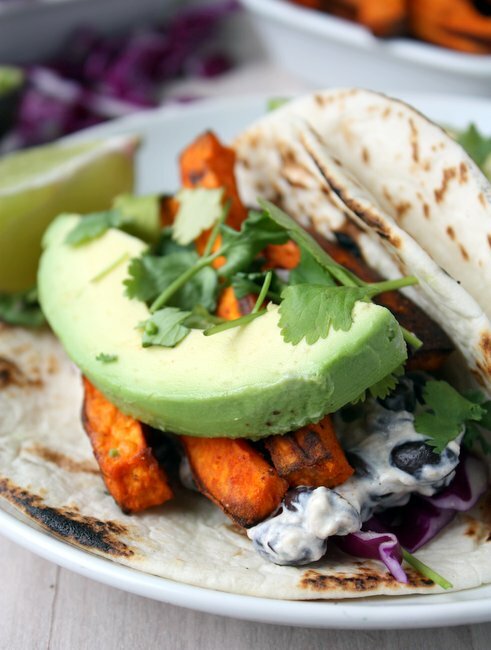 Slice up some cabbage, melt some cream cheese and mix in cumin and beans, chop cilantro, get some avocado, add the sweet potato fries, and you really have one insanely delicious vegetarian taco. You could throw on extras if you really felt like it (shredded cheese, tomatoes, pulled pork!). Another pro tip, if you’re using store-bought tortillas: burn ’em! I turn my gas stove on and, with tongs, blacken my tortillas a bit. Maybe it’s just me, but I love a little char on my food. And it makes them pretty! See!? Love it. Go make these asap! You can thank me later. Slice the sweet potatoes into 1/4″ straws, and rinse under cold water for 30 seconds. Thoroughly dry the sweet potatoes with a kitchen towel, then toss with olive oil, salt, pepper, and smoked paprika, in a large bowl. On an unlined baking sheet, arrange sweet potato straws 1/4″ apart, not touching each other. Bake for 15 minutes without touching, then remove, flip (keeping spacing), and bake for another 15 minutes. As your fries are baking, melt the cream cheese in the microwave for 30 seconds. When it is hot and runny, mix in the cumin and then the black beans. 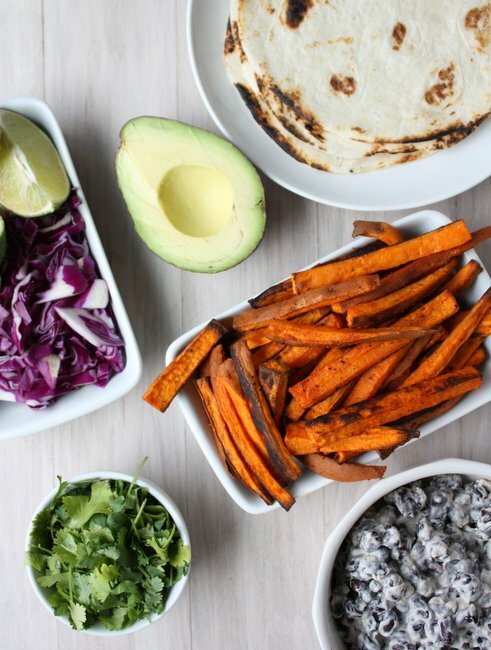 When your fries are done, assemble the tacos with all remaining ingredients. 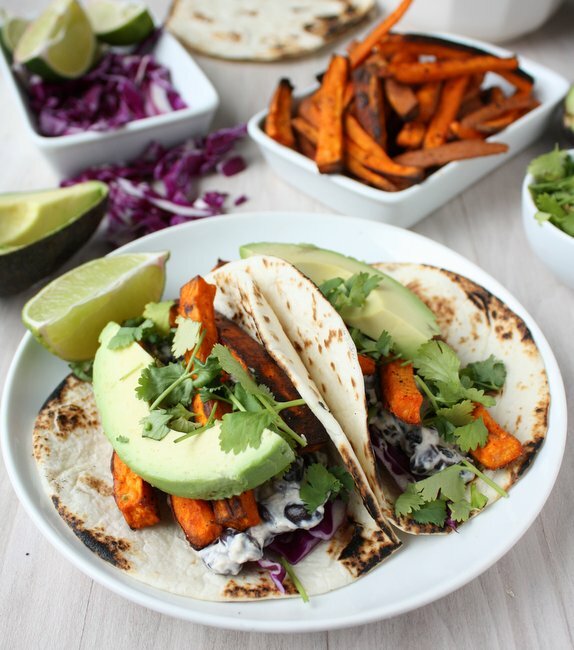 I cannot wait to make these for dinner tonight. The perfect reward after a nice long hike today. Thanks Mary! I’ve made these twice now and they are fantastic. I’ve even experimented with seasoning the sweet potatoes with Jerk Seasoning and Chili Powder (surprisingly AWESOME). Sorry for the inconvenience! I’m not sure I can do it… next time you get an email, I think you should be able to click a button that says “Unsubscribe me from this thread” (or something along those lines) — see if that works! If not, let me know and I’ll try again… but I’m having no luck!